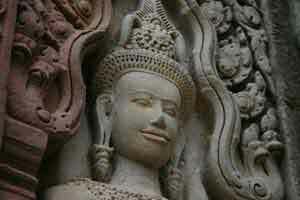 Cambodia is a beautiful country that is rich is history and culture. 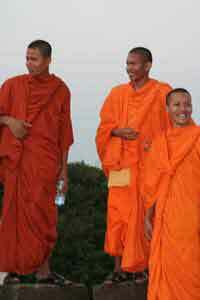 Many people choose to combine a trip to Cambodia with a visit to its neighboring countries as well. 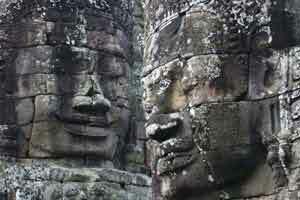 Some people choose to visit Siem Reap and Angkor Wat on a short visit from Thailand. Others travel overland from Vietnam, through Cambodia, and on to Thailand. This itinerary is perfect for those who are flying in and out of Phnom Penh. Alternatively, you can travel to Phnom Penh overland from Vietnam and then begin your Cambodian visit from there. Phnom Penh is the capital city of Cambodia. Located where the Mekong and Tonle Sap rivers meet, it is the largest city in Cambodia. Many visitors enjoy walking along the riverfront, which is where you'll find many restaurants and cafes. Phnom Penh is a great city to soak up the Cambodian culture, try its delicious food, and immerse yourself in the fascinating street life. Some of the most popular sights in the city include the Royal Palace, the National Museum of Cambodia, Wat Phnom, and Sisowath Quay. Spend a few days in Phnom Penh orienting yourself to the Cambodian culture before traveling on to Battambang. Battambang is the country's second largest city. It has many ancient temples, Buddhist shrines, and the bamboo railway nearby which attract a lot of tourists. It's a fascinating city to visit because it is modern with a small town atmosphere. There is still some colonial architecture that remains, giving the city its own unique charm. From Battambang make your way to Siem Reap. Siem Reap is best known as the gateway to the world renowned Angkor Wat. Angkor Wat is the must-see site of Cambodia. The town of Siem Reap is just a short tuk tuk ride from the famed temples. The temples are surprisingly spread out and it is worth renting a bike or hiring a tuk tuk to explore the area. The town of Siem Reap is quite quaint and has a variety of restaurants and bars that cater to the tourist crowd. In town there are many affordable accommodation options, and just outside of town you'll find many of the high end hotels. From Siem Reap continue on to Kampot. Kampot is a small town that is the gateway to Bokor National Park. The main attraction in the park is the old French hill station at 1,080 meters. It can be reached as a day trip from Kampot. In Kampot, most visitors enjoy relaxing by the riverside and exploring the nearby countryside. From Kampot go to the coastal town of Sihanoukville. This town is home to Cambodia's most well known beaches. While not as crowded as Thailand's beaches, they can be busy on weekends. The cleanest beach is Otres Beach. After relaxing for awhile on the beach, return to Phnom Penh to complete your trip. Many people spend time traveling through all of Southeast Asia. 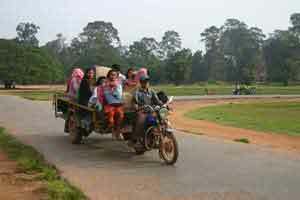 During this trip they may pass through Cambodia while traveling overland. It's possible to cross overland from Vietnam into Cambodia and then go from Cambodia into Thailand. This route can also be done in reverse. When you're coming from Vietnam, a common border crossing is at Chau Doc, Vietnam in the south. In Ho Chi Minh City you can pick up a tour that takes you all the way through Southern Vietnam into Phnom Penh. Alternatively, it is possible to do this on your own with public transportation. Once you've crossed into Cambodia you can pick up a ride to Phnom Penh. The trip itself can be a fun adventure, particularly if you do it independently. Once you make it to Phnom Penh, you can spend a few days in the capital city getting to know the Cambodian culture. There are several great sites and attractions in the city. Many visitors choose to stay near the riverfront, which is one of the more scenic parts of the city and has many restaurants and cafes nearby. After you've had some time in Phnom Penh, make your way to Siem Reap and spend some time exploring Angkor Wat. It is worth at least a few days of exploration. 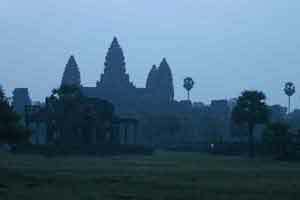 After all, Angkor Wat is one of the most famous sites in the world. Rent a bike or hire a tuk tuk to explore the entire complex. Once you've seen Angkor Wat, you can travel by road or air to Bangkok. If you go overland, the road crosses at the Aranyaprathet/Poipet border and then continues on to Bangkok. Although the road used to be quite challenging and time consuming, it is now paved the entire way.